Announcing A New Gift of Healing Hope — Wendy S. Harpham, M.D. As of midnight March 18, 2018, my passion project is out in the world. For a peek inside my new book, read on. If you're looking for a gift of hope for the cancer survivors, caregivers and healthcare professionals in your life, here's what makes Healing Hope--Through and Beyond Cancer special. An introduction to hope (what hope is; how hope helps) and Healthy Survivorship. To give you a peek at what's inside, on pages 30-31 you'll find ideas and an image to help you overcome the challenge of feeling hopeless after a doctor says something that takes away your hope. 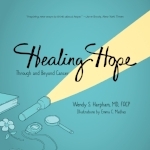 Healing Hope--Through and Beyond Cancer is available through all major online distributors, such as Amazon and Barnes & Noble. For individuals and organizations interested in purchasing 10 or more copies, contact Curant House for special-sales pricing and ordering.